It would have been mean of me to not share this recipe with you. Cruel, in fact. These Turkey Stuffed Bell Peppers from Skinnytaste are so juicy, flavorful, and delicious that with every bite I wished I had about 3 more stomachs to fill with only this meal everyday for the rest of my life. You might want to make them. Heat oven to 400° F. Spray a little olive oil or canola oil spray in a medium sized saute pan and head on medium. Add onion, minced garlic, and cilantro to the pan. Saute about 2 minutes then add ground turkey. Season with salt and garlic powder, and cumin, and brown meat for several minutes until fully cooked through. Add 1/4 cup of tomato sauce and 1/2 cup of chicken brother, mix well and simmer on low for about 5 minutes. Combine cooked rice and meat together. Cut the bell peppers in half lengthwise and remove all seeds. (I also carefully cut out the stems so that the pepper was still intact.) Spoon the meat mixture into each pepper half and fill it as full as you can. 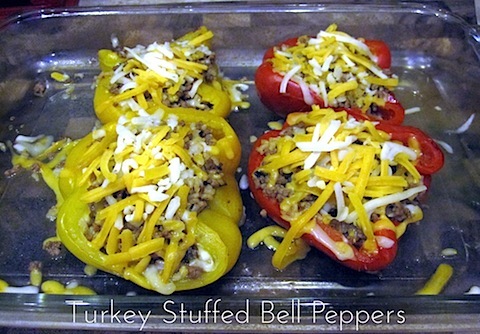 Place all stuffed pepper halves onto a baking dish and pour the remaining chicken broth on the bottom of the pan. Cover tightly with foil and bake for about 35 minutes. Top with shredded cheddar cheese and enjoy! Yummy - I adore a stuffed pepper. Never tried it with turkey before though. I made chili stuffed peppers for tonight! These sound great, too! 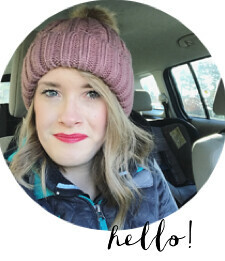 Frugal Feeding- you should try it! I'm sure it would be quite similar with ground beef too.